We’ve all been there. You’re heading to a friend’s place and running late. Said friend impatiently texts you, asking where you are. You text back, and the frustrating exchange continues until you finally, apologetically meet up. Good news if you’re a WhatsApp user, though: Your phone can handle the back-and-forth for you. 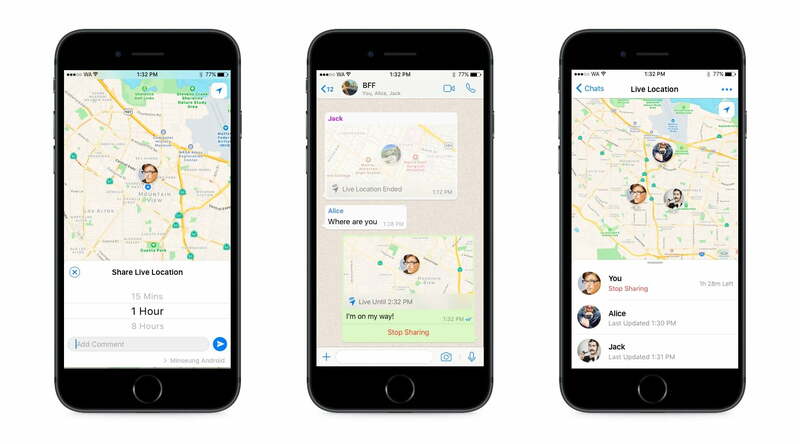 On Tuesday, October 19, the Facebook-owned messaging app announced Live Location, a new feature that lets you share your real-time coordinates with one or more WhatsApp chat buddies. It’s encrypted end to end to ensure privacy, Facebook says, and has an expiration timer that automatically stops location sharing after a predefined window. Here’s how to use it: When you’re texting someone (or a group of someones) in WhatsApp, tap the Location menu under the plus-shaped Attach button. Hit Share live location, add a comment, and choose how long you’d like your coordinates to remain public. Tap the Send button, and you’re good to go — your WhatsApp friends can see you now. Multiple people can share their locations at the same time, in which case they’ll populate WhatsApp’s in-app map all at once. And it’s platform agnostic — location sharing will roll out to Android and iOS users in the coming weeks. Live Location isn’t Facebook’s first experiment with location sharing, interestingly. In 2015, the social network added a one-tap location sharing to Messenger, and in May tested a real-time location feature that shared your whereabouts for an hour at a time. But while competitors like Google have been relatively quick to embrace real-time social mapping, Facebook has taken a more cautious approach. There’s a reason: Back in 2015, Messenger grabbed headlines for sharing users’ location information without their knowledge.